Diane and Jess admit a mini cab driver involved in an RTA into AAU who seemingly has no name and no next of kin, upon examining him Diane declares that he needs to be in theatre straight away if they’re going to save his leg. Meanwhile Ed is called down by Steve to treat the mini cabs pregnant passenger; she is confused and seems to have lost her memory making communication difficult. She is suffering from mitral valve disease and Ed asks Steve to prep her for theatre at once. It’s the day of Chrissie’s abortion and she refuses Owen’s offer to go with her, insisting that she’d be better going on her own. Mubbs is giving the pregnant RTA victim, Jenny, an ultrasound and confirms that she is 26 weeks, the woman is pleased but still confused about her circumstances, convinced that it is Spring 1999 and that she is about to get married. Lisa goes to see Terry and Kath, and father and daughter tell each other how much they love them before the nurse arrives to care for Terry during the day. Ed talks to an uncomfortable Chrissie and she tells him that after the afternoon then can pretend it never happened, Ed hesitates but she doesn’t want to hear what he has to say. Tom is in his office and Ed asks if he’s ready for the party that night, he says he is, claiming to be wearing his party frock but after Ed leaves the Consultant sneaks a drink from a concealed bottle in his drawer. Kath arrives on Kellar and asks Ric if she can have some diamorphine for her and Terry’s trip to his beach house. Ric agrees and asks after Terry, concerned about the toll his illness is taking on Kath. Jenny has arrived on Darwin and Tom comes to talk to her about the operation whilst Owen, Chrissie and Ed look on. The atmosphere between them is tense and when Ed looks at Chrissie she refuses to meet his eye. Jenny is frightened about the effect the operation will have on her baby and Owen tries to reassure her. Ric and Diane are operating on the cabbie, nicknaming him ‘Travis’ after Robert DeNiro in ‘Taxi Driver.’ Owen and Chrissie are arguing about their patient but are interrupted by the arrival of Paul, Jenny’s ex fiancé who says he hasn’t seen her in over 3 years. They tell him that Jenny won’t let them operate and beg him to make her reconsider, he tells them that she had an abortion before their wedding which is why they split up, he is reluctant to talk to her again. Terry and Kath have arrived at the beach house and are greeted by Terry’s neighbour Mr Johnson, he offers to call in later to see in the New Year and Terry agrees. Paul meanwhile has agreed to see Jenny and she tells him not to let them operate as Chrissie watches on. Terry decides he wants to go for a paddle and hobbles into the surf, letting the cold water wash over his feet as Kath laughs, they kiss and Terry asks once more for Kath to help him end his life. She tells him she wants some time on their own and he says being anywhere with her makes him happy and that he’s the luckiest man alive. Paul and Jenny are discussing that they didn’t want children before because of her heart problem and she becomes upset, not understanding that time has moved on and he isn’t her husband. Chrissie asks Paul not to give up, suggesting he lie to her. Paul tells her Jenny she won’t die and persuades her to let them take her to theatre. Paul tells Chrissie he can’t decide the fate of another man’s child as Ed looks back at them. Ed catches Tom drinking in his office and confronts him furiously; he pages Mr Farraday saying that Mr Campbell-Gore’s been taken suddenly ill. At the beach house Terry removes one of the diamorphine syringes when Kath isn’t looking. In theatre Owen tells Ed that the foetus is distressed and they need to move fast however Tom is pacing his office and continuing to drink and Farraday can’t be there for another 20 minutes. Ed tells Owen he can deliver the baby as they’re running out of time. Sean has arrived on the ward and brings Sandy flowers; she invites him to the New Years Eve party and suggests she might forgive him. Owen delivers Jenny’s baby boy by C-section and Sandy discovers who her real husband is; Ric and Diane’s taxi driver, Dean. 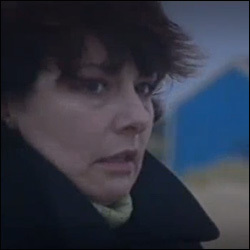 Kath tries to confront Terry about the missing syringe and he tells her he wants to die before he becomes somebody else, he pleads with her to help him once more. Dean has come round from the operation and Paul is sitting with the baby in SCBU where Chrissie finds him. Dean tells her that the baby is like the one he and Jenny should have had and asks why it always has to matter who the actual father is. Chrissie says it probably matters to Dean. Ed finds Tom in his office and agrees to prescribe him a drug to stop him drinking. Paul confronts Dean and Chrissie leaves the two men alone as they argue over Jenny. Chrissie takes Jenny to see Dean but she doesn’t recognise him. Kath agrees to help Terry but only because she can’t refuse him anything, telling him he’s broken her heart she breaks down in tears. In SCBU Dean tells Jenny the story of how they met and her memory comes back, Chrissie can’t bear to listen any longer and rushes outside where she tells Owen that she can’t go through with the termination. The party has begun and Mubbs and Lisa are dancing together whilst Terry and Kath stand in the dark by the sea. Tom is pouring drinks at the party and Sean is refusing to dance with Sandy. Danny and Lisa slow dance and Sandy watches the others enviously as Sean makes her leave early. Chrissie and Owen arrive and Chrissie tells Ed that the abortion didn’t happen, suggesting he find someone to dance with. Kath prepares the syringe driver as Mr Johnson arrives with a bottle of champagne; he sees what is going on and decides to leave after Kath answers the door and tells him that Terry is tired. Chrissie refuses champagne and Owen tells Tom that she’s pregnant as Ed listens. The New Years count down begins as Kath injects Terry and the clock strikes midnight, Terry and Kath curl up on the bed together as he dies. The staff sing Auld Lang Syne and Danny and Lisa leave the circle making Chrissie join hands with Ed so she’s caught between two lovers. Sean leaves Sandy to see in the New Year alone whilst everyone at the party continues to enjoy themselves, Ed however is sitting alone. Danny and Lisa go outside to watch the fireworks, they kiss passionately as Kath realises that Terry is dead. Dean Yates – Cab Driver involved in RTA. Jenny Yates – Pregnant wife of Cab Driver. Diane: Hey Jess, what have we got, mate? Jess: No name, no address, no next of kin, no medical records. These are x-rays from A&E.